Give your traditional mulled cider a kick with the addition of spiced rum and jalapeño-infused green Tabasco sauce. All photography courtesy McIlhenny Company. Whether you’re celebrating a special occasion or just trying to warm up the winter, try these spicy, seasonal cocktails. 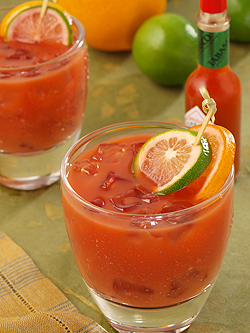 Here, we present three colorful drink recipes, courtesy of the McIlhenny Company, makers of Tabasco sauce, that are sure to keep spirits up when the temperature is down. A mixture of blood orange juice and brandy, with bitters and a shake of Tabasco sauce, this brightly colored cocktail is sweet but sophisticated. Combine blood orange juice, bitters and Tabasco sauce. Serve over ice and garnish with orange and lime slices. When planning a soirée, you want to serve a signature cocktail as special as the occasion. Served over ice, this blend of two popular ingredients—pomegranate juice and white wine—plus ginger ale and Tabasco sauce, make this cocktail familiar yet different. 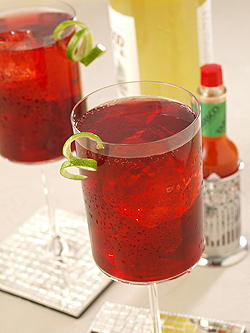 Combine pomegranate juice, white wine, lime juice and Tabasco sauce. Place ice in two tall glasses, and add juice mixture. Top with ginger ale, and garnish with lime peel twists. Here, the traditional combination of apple cider, cinnamon and honey (instead of sugar) gets an extra kick from spiced rum and jalapeño-infused green Tabasco sauce. A fresh apple wedge and a cinnamon stick top off this cold-weather comfort cocktail, that is a feast for the eyes as well as the taste buds. In 1-quart saucepan over high heat, heat apple cider, cinnamon stick, honey and green Tabasco sauce to boiling. Reduce heat to low, and simmer 5 minutes. Remove from heat, and add rum. 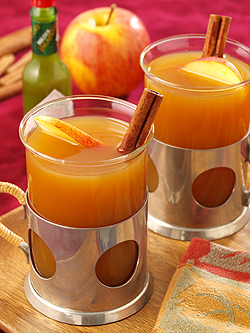 Pour into glasses, garnish with apple slices and optional cinnamon stick, and serve warm.